Welcome to the second-ever Give a Sh*t Book Club discussion! Here’s how it works: Every month, I pick a book that has particular social or political relevance to what’s going on in our nation and the world. Then the last Saturday of the month, I post my thoughts and reflections about the book, and anyone who so desires can jump in on the discussion too. It’s a way for me to commit to staying engaged with the dystopian nightmare the U.S. has become in the past few months, without totally burning myself out with doom and gloom. Trying to find that balance! It’s not easy, people! I also want to educate myself on some of the issues in the news, so that I can speak intelligently about them if given the chance and hopefully to avoid being part of the problem. 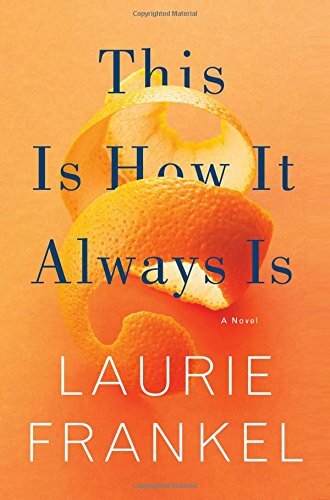 This month, I chose This is How It Always Is by Laurie Frankel. It’s a novel about a married couple, Penn and Rosie, who have five boys. However, their youngest child, Claude, tells them from an early age that he wants to grow up to be a girl. The book is about how Penn and Rosie try to parent Claude, who they come to call Poppy, in a way that empowers her but also protects her from the judgmental masses who balk when they see a little boy in a dress. Because the impulse to protect your child is a natural one, right? You know from your own school experience how cruel kids (and adults, for that matter) can be, and it makes all the sense in the world that you’d want to shelter your child from suffering. But as the novel shows, Penn and Rosie’s attempts to maintain Poppy’s privacy and keep her biological gender a secret fall short. I thought both their efforts to keep Poppy’s secret and the inevitable failure of those efforts were equally realistic. As they conclude by the end of the book, maybe it’s best to help Poppy be Poppy even if it’s not easy, since being Poppy isn’t and wasn’t ever going to be easy, no matter how hard they tried to make it so. I appreciated how the novel depicted Poppy’s brothers and how her parents’ decisions weighed on all their lives. Families with five kids have to compromise other kids’ needs for the sake of one sometimes, but Poppy’s family has to do this more than most, and nearly all their big decisions center around her and her needs. It makes sense that this would cause tension. I have to take issue with one aspect of the book: the trip Poppy and Rosie take to Thailand. I am not a fan of “poverty tourism,” where comparatively wealthy people travel to impoverished areas and then return home armed with their little epiphanies, newly grateful for their comfort and ease. It reduces real people and their experiences to little more than a tool, a lesson for rich white people so they can feel better about themselves. Even though Rosie makes a big deal in the narration about how she loves the people and plans to go back and help out in the rural clinic, she is still coming from a very privileged place and views the people she meets as little more than vehicles for her own enlightenment. Also, the accented English spoken by the Asian characters (written by a white author) made me squirmy. I wish Rosie and Poppy could have found a way to think through their issues without using and appropriating another culture. Ultimately, though, I thought the book succeeded at depicting both a big, loving family and what it’s like to parent a child with gender dysphoria. I learned a lot about what it feels like to be someone like Poppy, and to love someone like her. With all the bathroom bills and legalized discrimination in our country lately, it's important to remember there are real people and real lives at stake here. The book reminded me that people like Poppy have the right to exist, as their truest selves, in this country, the same way everyone else does. What did you think of This is How It Always Is? Let me know in the comments! And if you missed out on this month’s book, don’t worry, because I’ll be back next month with another relevant and timely book pick!